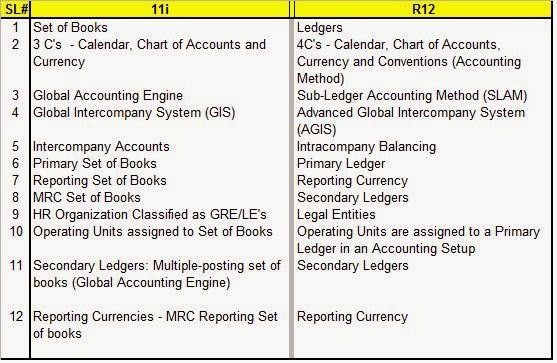 R12 is the latest version of the E-Business Suite and defined as Global Business Release Focusing on working, thinking and managing Global Organization. A single responsibility to access and transact on multiple organizations. A single ledger to manage multiple currencies. Ledger sets to manage accounting processes across ledgers. Centralized rules engines for tax, accounting and inter company. A separate and simple payment creation and delivery solution. Centralized trading partners (suppliers, banks, first party legal entities). Simplified reporting via XML Publisher. Multiple Ledgers- From Set of Books to Ledgers and Ledger Sets. Legal Entities and Accounting Setup. Shared Service Access Controls - From Multi-Org to Multi-Access-MOAC (Multi Org Access Control) - Role based access to Operating Unit. from Multi-Tax Codes to E-Business Tax (EB Tax). Intercompany using Advanced Global Intercompany (AGIS).